Hi Doodlebug friends - today I am so pleased to share with you one of my favorite techniques, paired with some of my favorite Doodlebug products! I have always loved making fun fold cards. I love the extra element of fun that a card with interactive parts to it adds - it gives the card recipient a little extra surprise when they open up the envelope! I love that! And while I adore all the themed lines that Doodlebug puts out, I love the fact that they have so many basic supplies that I reach for all the time. Some of my favorites are Petite Prints, Doodle Twine, Doodles card sentiments and all the amazing embellishments that are perfect for any project! Step 1- Using a scoring tool, take a 4 1/4 x 11 inch piece of cardstock and score at 4 1/4 and 8 1/2 inches on the 11 inch side of the paper. 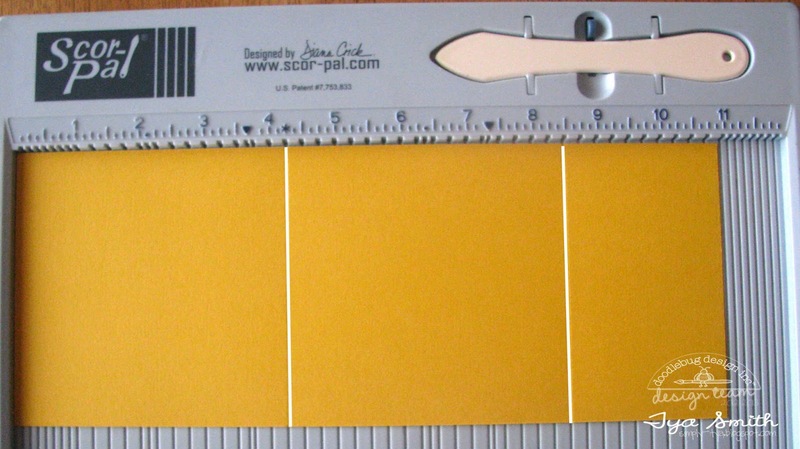 Step 2- Take your 2 1/2 inch circle punch and line it up as shown on the score mark you made at the 8 1/2 inch mark. Slide the punch all the way in making sure that the score line is in the middle of the circle. Punch out the circle. 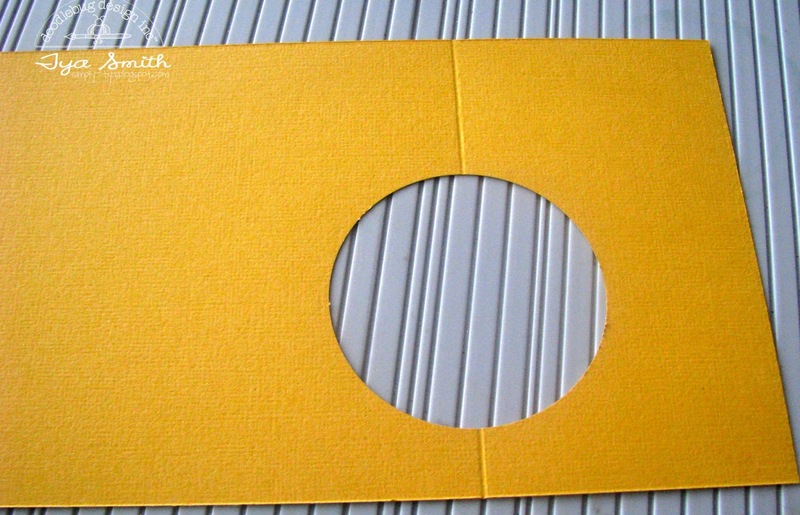 Step 3- This is what the card will look like with the circle punched out and all the score lines folded. 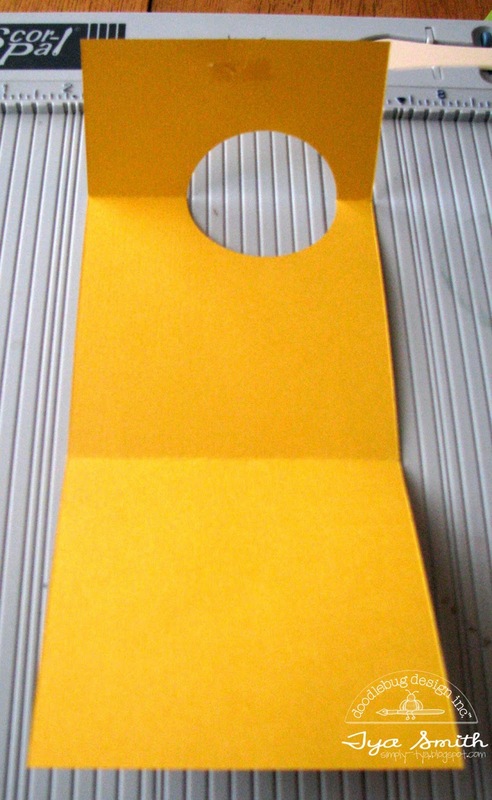 If you want to- add a little bit of adhesive to the underside of the the top flap as shown. Step 4- Now comes the fun part! 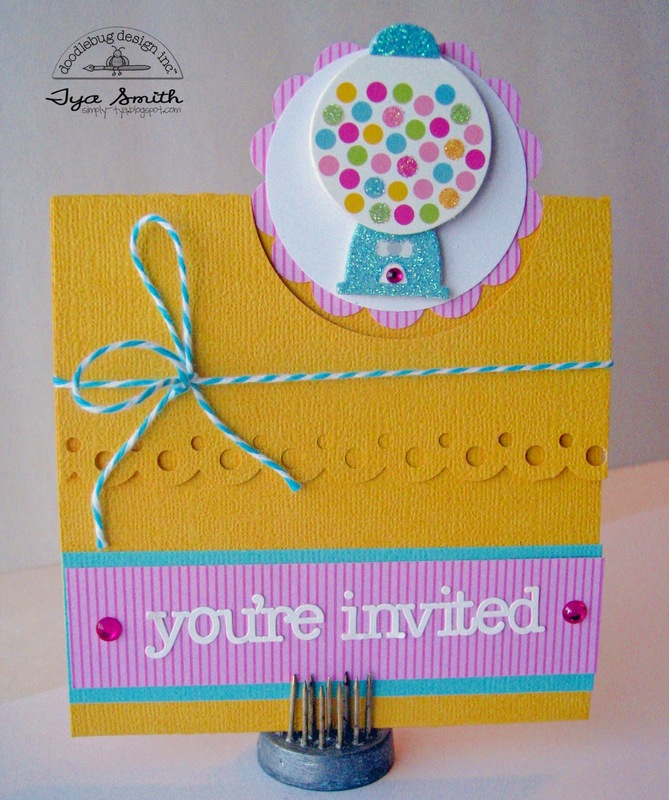 Punch out a scallop circle from the petite print paper. Punch out a 2 inch circle from white cardstock. Add a Doodlepop to the center of the circle. 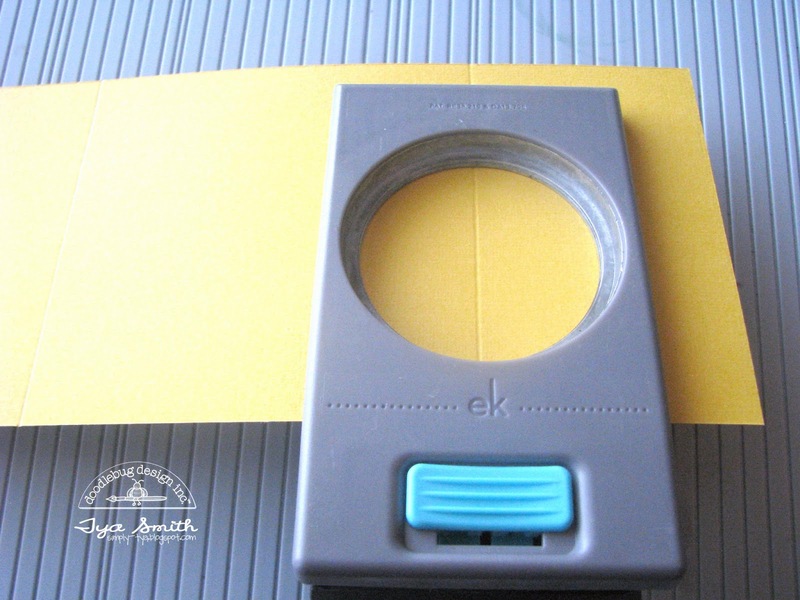 Punch out edge of cardstock with your choice of border punch. 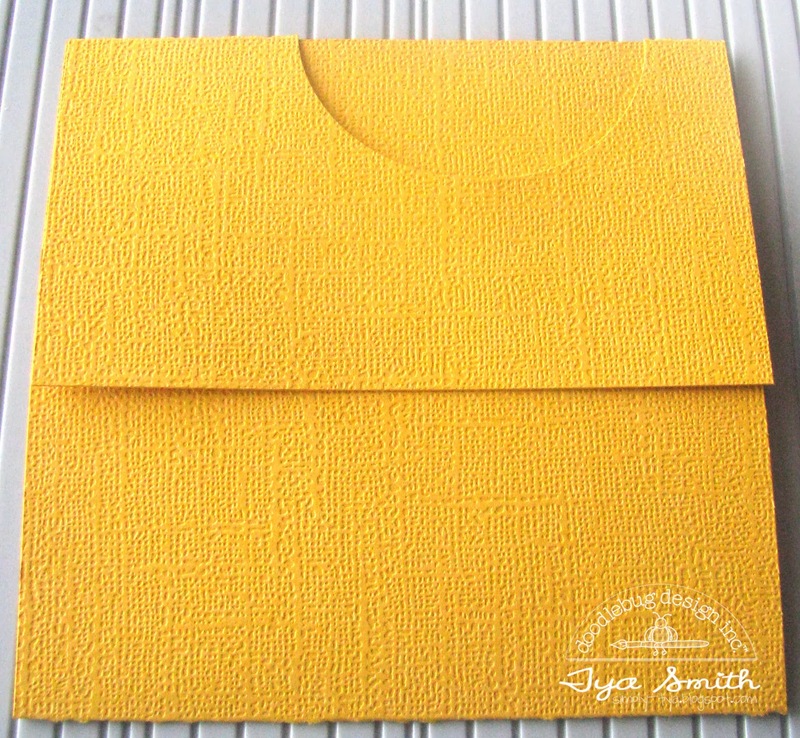 Add the Petite Print and cardstock paper strips. Add Bakers twine to the top of the flap. 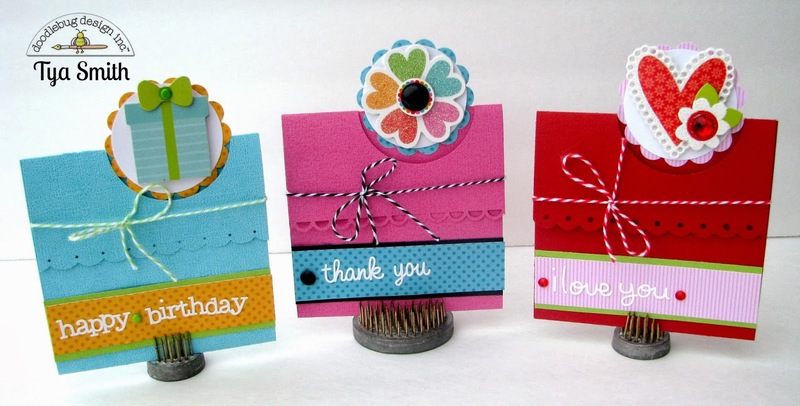 Add Doodle card sentiment and embellishment. Here are just a few different varieties below using all the same basic elements. Just change the colors, sentiment and Doodle-Pops to match your theme and you have a sure formula for making adorable cards like these over and over again! Thanks for stopping by today! SO cute and easy to do! Thanks Tya! 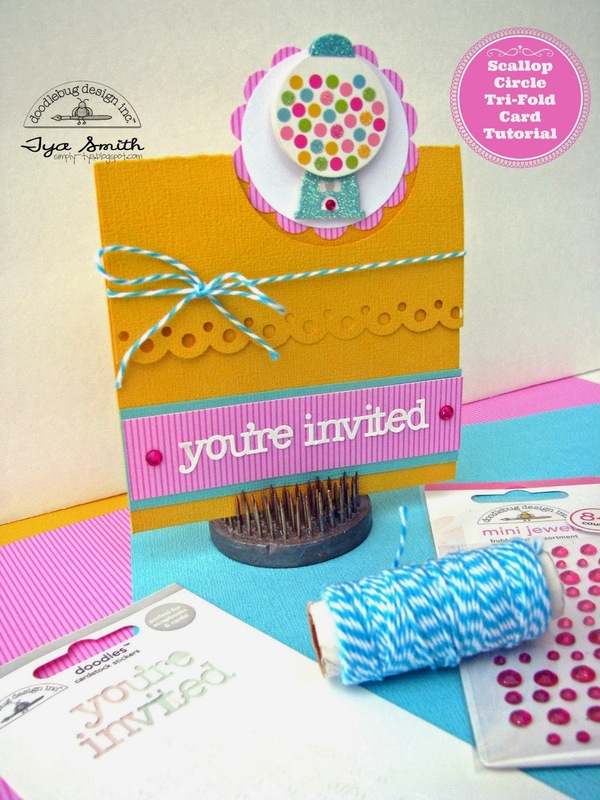 THANK YOU for sharing your FABULOUS tutorial Tya!!! oh wow! so simple and quick to make!! love how awesome it is! Adorable...this is such a cute design. I think I will be making one soon!